The weekend just gone was my birthday weekend, as you will all know if you follow me on twitter. I was in Manchester for a couple of gigs to celebrate and had some birthday money to spend. I'd seen on the Birchbox blog page that the build your own Birchbox was coming to Selfridges Exchange Square from the 4th February, this was so exciting. 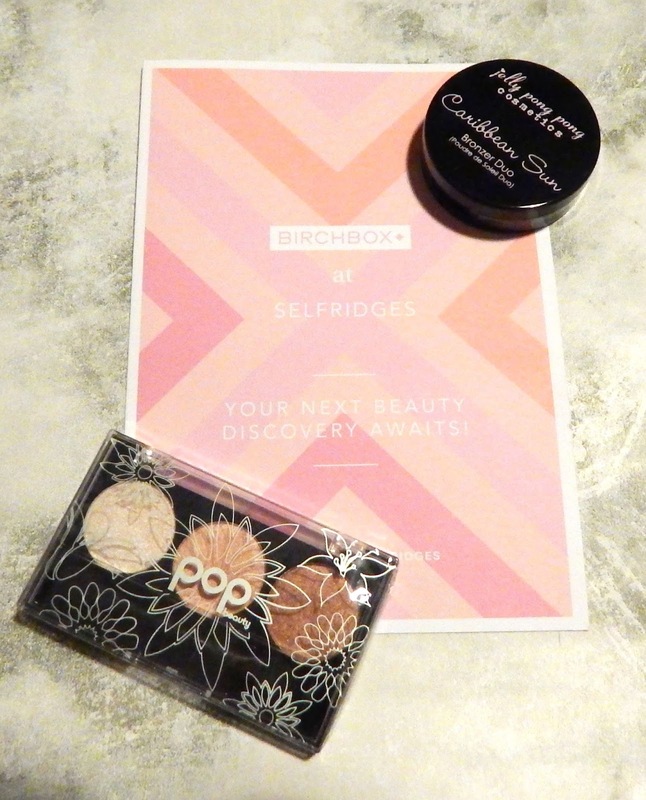 I knew that Birchbox and Selfridges has collaborated like this before in the London store so I was chuffed to bits to hear that I could get my hands on one in my local store and on my birthday weekend. I got off my train on Friday afternoon and headed straight to Selfridges, down to the ground floor (the beauty department) and there it was, the Birchbox stand at the bottom of the escalator in all its glory. I was straight in there looking at all the products, an assistant approached me promptly and was very helpful in the whole process of building my own box. The assistant who I didn't catch her name was very knowledgeable on every product available and spent time with me to pick every item, showing me how products worked, what qualities they had and showed me swatches of the makeup products. I was handed a booklet with every item to pick from in it, so I could read about the products as well as listen to the assistants advise, I was even able to pick what colour bag I wanted my items in and of course I chose purple. After receiving a exclusive designed Birchbox and a Birchbox bag to put my items in and having the assistant guide me around the products, I built my own Birchbox. First up was the makeup items, you could pick 2 makeup items. Jelly Pong Pong are regular items in Birchbox monthly subscription and I love the brands products. This is a full size product as well which was another plus for choosing this item. Some of the other products was sample size so being able to get a full size product seems more value for money to me. This is a 2 in 1 item with one side being a bronzer and the other a blush making it the ultimate spring/summer product. 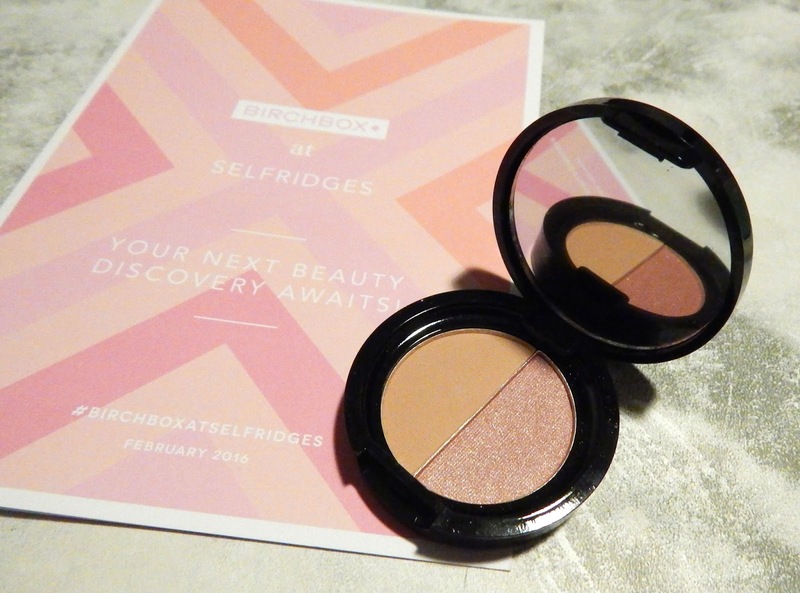 It's a handy compact to fit in any makeup bag or handbag. I apply using a small brush to blend out onto the face easily and evenly. The peachy-pink blush is a great colour for summer and the long lasting qualities in Jelly Pong Pong products means re-applying isn't needed. This product will be taking a permanent place in my summer makeup bag. Eyeshadow's are a regular product of mine, I enjoy creating new looks and perfecting the smokey eye. This trio of eyeshadow's from POP Beauty are highly pigmented in neutral shades that are great for everyday wear. The assistant swatched all 3 of the shades onto her hand for me to see, I could see how easy it was to apply onto the skin and how little product was needed to gain the desired shade. I have later used the product to create a everyday smokey eye look that would be suitable for any skin tone too. I'm definitely going to be looking at other products from POP Beauty to try out. Skin care, Body care and Hair care products was next to chose from, 1 product from each of the categories was chosen. This Birchbox exclusive skin care product caught my eye because it is a face scrub which smells amazing. The lemon scent reminded me of the LUSH cuticle butter which is a favourite product of mine. I also thought that being a lemony product that this would refresh my skin. The scrub particles are rice powder particles so they are soft on the skin and not harsh in any way. I've used facial scrubs before which have been harsh and hurt my skin so this was intriguing to find a soft scrub. After applying to damp skin and rubbing in circular movements, my skin was left feeling refreshed and smelling great too. The lemon scent really makes this product great, I would re-purchase a full size product in the future. Rituals is a brand I've got to know through Birchbox, I received a shower foam in my December subscription and really liked the product. Again the smell of this body cream made my decision for me, with honey and rose as ingredients the scent is lovely. I tried the product on my hands whilst in store with the assistant and I could smell the product all afternoon on my hands. My hands felt soft the touch after applying and I have continued to use the product since buying. 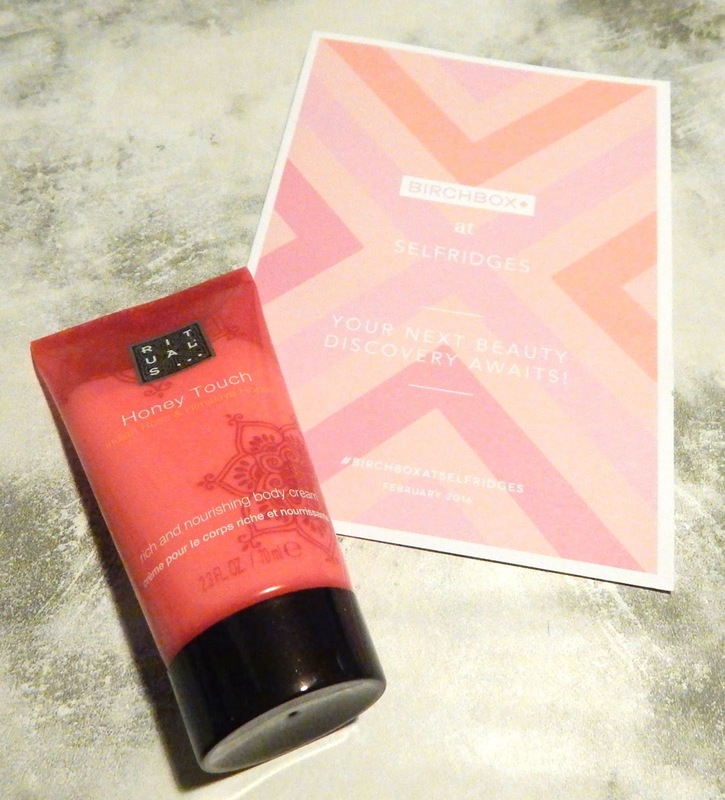 It's a decent sample size which fits into my hand bag nicely so I can apply on the go, although this is a body cream and not hand cream it has shown good results on my dry hands. 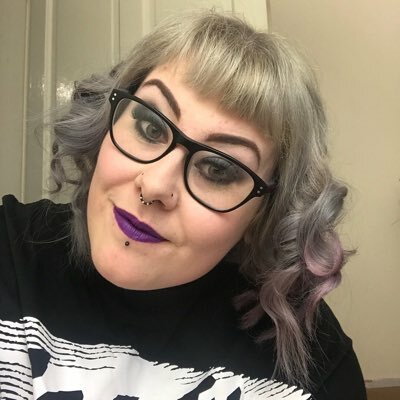 Choosing my hair care product was probably most difficult for me as 2 of the products was shampoos and I am a convert to just using my LUSH shampoo bars now, another product was a salt spray which although smelt amazing doesn't sit well on my hair, so the final product was my only real option. This was a Percy & Reed hairspray, I love the packaging on this bottle, the fashion illustration is amazing and makes the product look more expensive, its also a sample size item which means it fits into my hand bag too. The spray doesn't have that strong over powering hairspray smell which is great, the spray is a fine product which doesn't sit on top of the hair and make you look like your wearing hairspray. The hold is good enough to last all night but I'm not sure it would hold on these windy days we have had of late. 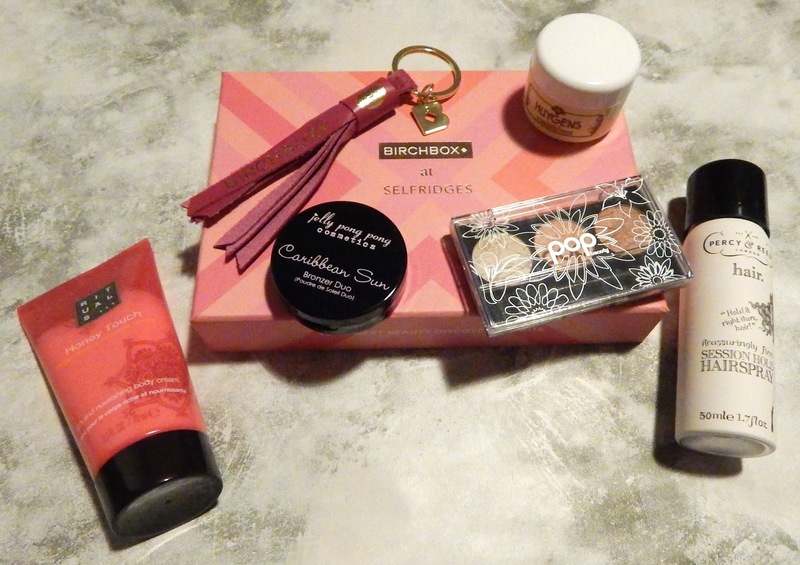 Just like in the monthly boxes a beauty bonus was available, choices was from 2 pillow sprays one being lavender which unfortunately makes me sneeze, a glittery toothpaste and a Birchbox leather keyring. I had seen the keyring on social media posts adverting the Birchbox at Selfridges experience so I'd already chosen that item before entering the store. I was glad that the other beauty bonus items didn't interest me much, this keyring is real leather, pink in colour and has tassel's with a gold keyring and gold B attachment. The ultimate Birchbox fan bonus I think. Overall there are 8 makeup items to chose from and 4 in each of the other categories, the price of the box is £15.00 which is £5.00 more than a monthly box but after postage at £2.95 it's only £1.05 more and you get to chose your own items and have a great experience too. I would definitely build my own box again should the event happen with different and new items in the future. If your not a monthly subscriber to Birchbox, the content card supplied with the build your own box has a discount code to get out first box for just £5.00! You can sign up using this link here. 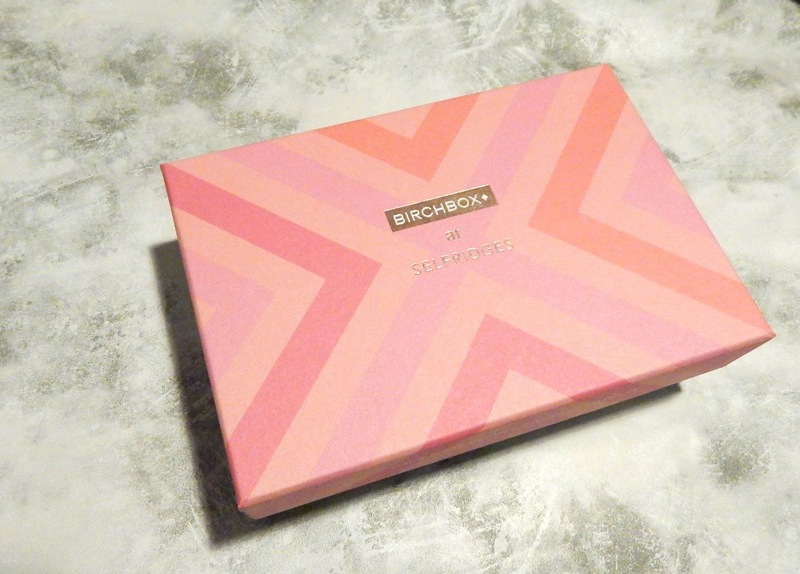 My monthly Birchbox has also been delivered this week so keep an eye out for a review post on that coming up. 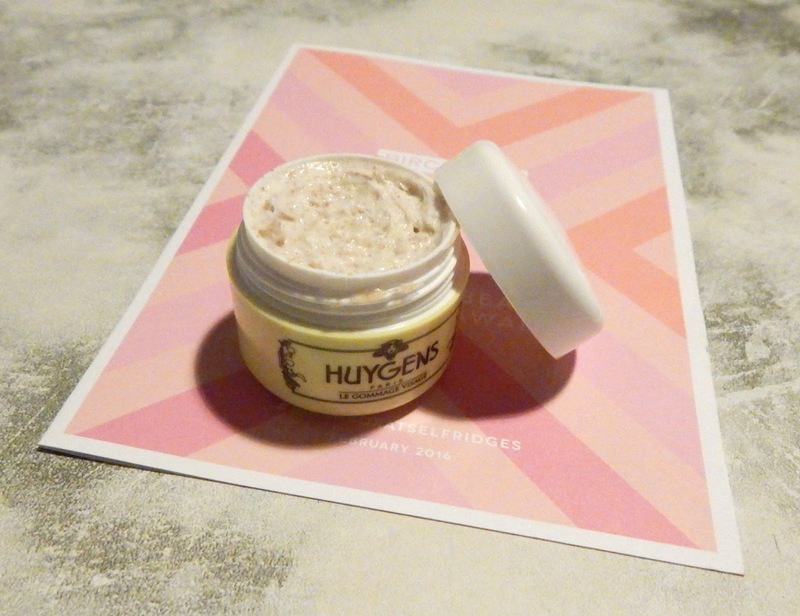 Have you been to built your own Birchbox at Selfridges? If Manchester Exchange Square isn't your local store Birchbox will be at the Trafford Centre store from 20th March until the 9th April and at the Birmingham store from 29th May until 11th June. It really is a great experience and value for money, I hope lots of you can go and enjoy building your own Birchbox. It was so much fun!! I don't tend to use much hair spray unless its needed but it was the only hair care option for me really. The scrub is lovely, smells so good!